Europe and the Southern Mediterranean Countries (SMCs: Algeria, Egypt, Libya, Morocco, and Tunisia) are tied by a long history of economic and political relations. Up until the early middle ages, the Mediterranean Sea played a crucial role in ensuring flows of information, people and goods between Europe and distant countries. Anchoring the reforms to a shared long-term goal (a joint economic area by 2030). Moving towards such a vision requires a better understanding of the economic linkages between Europe and the SMCs. In the Bruegel Policy Contribution How wide is the Mediterranean? we have attempted to quantify the degree of integration between key European countries and the five SMCs (in terms of trade, investment flows, financial flows, migration, and aid). The aim is to identify key-patterns of interaction. For this purpose we have conducted a comparative analysis by putting the economic relationship between the SMCs and European countries in the context of their economic size and their geographical distance. Source: Bruegel based on UN Comtrade database (UN Statistics Division, 2011). France is one of the top two sources of FDI for all five SMCs. Italy has invested relatively more than France in Tunisia, Algeria and Egypt. In Libya, Italy is less involved than one would expect from its historic and geographic linkages. Spanish FDIs are relatively large only in Libya and Morocco. The United Kingdom, the United States and Germany are not significantly investing in this region. Germany is even less active in Algeria and Egypt than the much more geographically remote US. Note: The graphs represent the breakdown of consolidated foreign claims on individual countries on an ultimate risk basis by nationality of reporting banks. The total corresponds to the total of the 24 source countries’ financial claims reported by BIS. Similar results can be obtained by looking at financial flows (Figure 2). 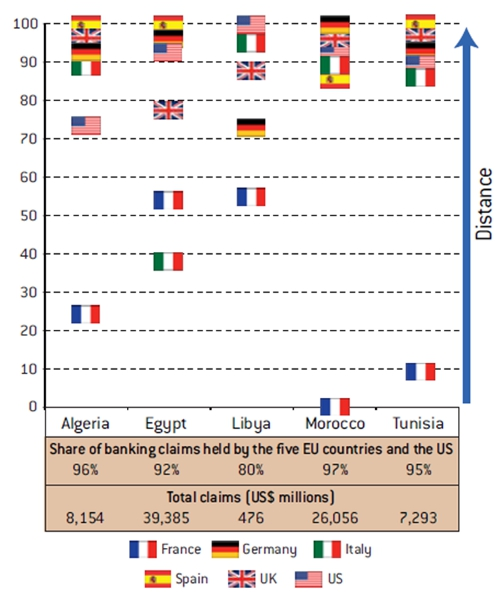 Despite differences in the openness of financial sectors in the SMCs, French banks by far hold the bulk of foreign claims in the whole region. After French banks, only Italian banks play a noteworthy role in Egypt. All other countries (UK, US, Germany and Spain) are under-represented relative to the size of their foreign financial sector claims. Source: Bruegel based on Ratha and Shaw (2007) updated with additional data for 71 destination countries as described in the World Bank Migration and Remittances Factbook 2011. By comparison, migration flows (shown in Figure 3) lie somewhat in the middle between trade and financial or investment exposures. They are shaped both by historical and geographical relations. 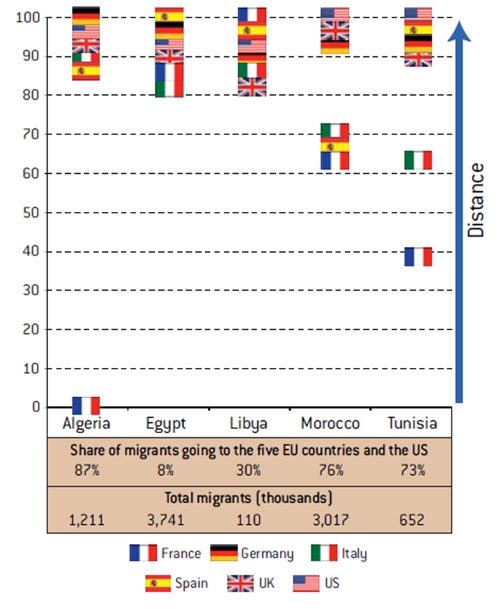 For example, France is a very attractive destination for emigrants from Algeria, Morocco, and Tunisia; Italy for Moroccans and Tunisians; while Spain only for Moroccans. Emigration of people from the SMCs to the US, UK and Germany is again negligible relative to the overall number of immigrants in these countries. Europe and the SMCs are not homogeneous blocks even in terms of official development aid. On the one hand, the US and Germany provide significant aid, relative to their overall foreign aid portfolios, to Egypt and Libya; on the other hand, France and Spain are the main donors for Algeria, Morocco and Tunisia. According to these figures, the UK continues to be virtually absent in the region. A strategic balancing of economic relationships could make the economic and political relationships between the EU and individual SMCs more predictable and robust, which will be to the benefit of all partners. 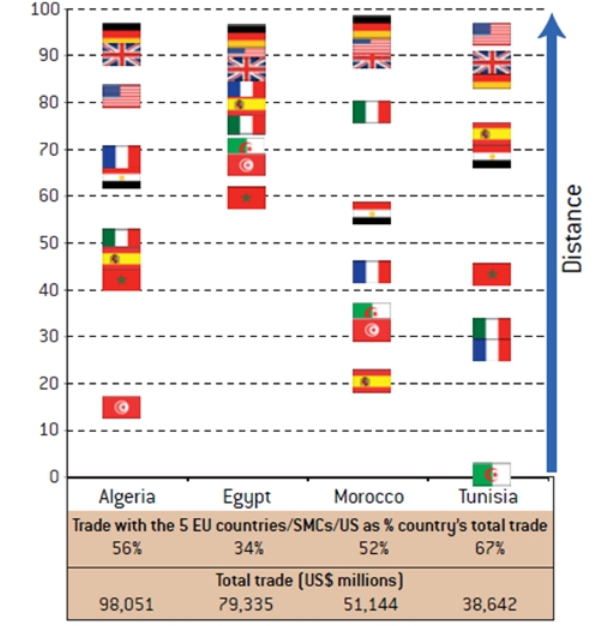 In terms of investment, trade, and financial and migration flows, France, Italy and Spain are ‘closer’ to Algeria, Morocco and Tunisia than what geographic proximity alone would suggest. The advantage of this special relationship for the SMCs is that they have three important advocates in the EU. The flipside of this special relationship is that other countries – such as Germany and the UK – are relatively more ‘distant’ from the SMCs in economic terms. This raises uncertainty. The concentration of FDI, external trade and external finance on a limited number of partners is a risky strategy because it makes these flows partially conditional on the economic wellbeing of a limited number of partner countries. All three sides – the EU Mediterranean countries, the EU non-Mediterranean countries and the SMCs – could gain from such a rebalancing of the economic relationship. But, to make this happen, all three sides would have to move. The EU Mediterranean countries would have to support their northern EU partners in becoming active in the region, for example by surrendering some of their privileged access. The non-Mediterranean EU countries would have to increase their economic exposure in the SMCs, for example by enabling some circular migration. And, finally, the SMCs should encourage economic activity on the part of nontraditional partners by lowering barriers for all partners, for example by making regulatory and decision-making processes more transparent. Hence, diversifying investment in the SMCs, and financial and trade flows while making labor freely mobile, to involve nontraditional European partners and cover more intensively non-western SMCs could be a good strategy for strengthening the relationships between the SMCs and the EU, and making the ties more resilient. While in relative terms this might involve a reduction in the importance of some individual EU partners in some SMCs, in absolute terms the link between all partners would be strengthened. This article is a shortened version of the Bruegel Policy Contribution, How wide is the Mediterranean?